*The Lindsay Cooper Songbook group regret to announce that for the forthcoming concerts in March, Dagmar will not be performing with us. This is due to a serious back condition from which she needs more time to recover. 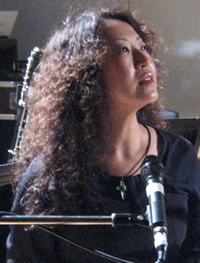 Stepping in as lead vocalist is Atsuko Kamura, whose work we have admired for many years. Kamura began in music in the 80's as vocalist and bassist of Mizutama Shobodan (Polka Dot Fire Brigade), the first feminist punk band in Japan. She toured the US with Tenko as the Honeymoons, joined the Frank Chickens in London, and the anglo-Japanese jazz progressive rock band Setsubun Bean Unit, and initiated projects such as I am a Kamura, with Robert Storey, and Kamura Obscura. Throughout her work she has maintained clear political, feminist, and ecological positions, campaigning recently against nuclear power, following the Fukushima disaster in Japan. *'Prince to Nihon, 4EVER IN MY LIFE' (Prince & Japan, Japanese Language, Shinko Music) has been published today. Including my interview. I formed Japanese Official Prince Fan Club in the '80s, so. and these got No1 & No2 on DISK UNION prog rock online sales hit chart on 14 Dec 2018! Yumi will present a paper regarding performing Lindsay Cooper's music by Half the Sky at The First International Conference on Women’s Work in Music, Bangor University, 6 September. (Next performance of Lindsay Cooper's music by Half the Sky will be at Cafe OTO, London, on 22 June and Avantgarde Festival, Schiphorst, Germany, on 25 June). Half the Sky will be playing in UK and Germany in June 2017 for the first time! Jump for Joy! and Half the Sky successfully completed Rock in Opposition 2016 performances. We had overwhelming responses, thank you so much for everyone there! Jump for Joy's debut album 'Bat Pullover' CD is now ready to ship from ReR and Disk Union (Japan), LP to follow soon. Meanwhile, Yumi will be on solo and collaborations tour in Japan, 21-31 Oct, please see gig dates page for details. so final lineup: Tim Hodgkinson, Yumi Hara, Geraldine Swayne, John Greaves. Jump for Joy! live recording at Gothenburg will be broadcast on 16 Feb on Swedish Radio. Jump for Joy! and Half the Sky will be performing at RIO 2016, 17 Sept and 18 Sept consecutively. 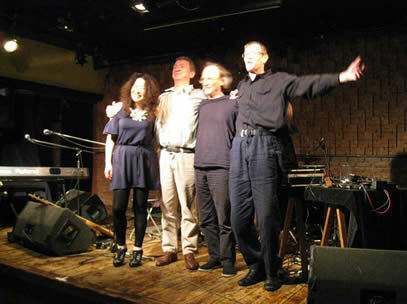 Half the Sky and Chris Cutler & Yumi Hara Japan tour has been completed successfully. Tracks from LOGOS by The Artaud Beats were broadcast on Late Junction, BBC Radio 3 and Battiti, RAI Radio 3 (Italy) recently. Yumi Hara & Sato Yukie and Dollhouse Residents will be on Japan Tour 24 Oct-1 Nov.
'Half the Sky: Music of Lindsay Cooper' 3-5 Dec in Japan. Yumi Hara, Chris Cutler, Keiko Komori, Yuriko Mokoujima, Miwazou Kogure, Wataru Ohkuma, Mitsuru Nasuno will play new arrangements of pieces written by Lindsay Cooper for Henry Cow and News from Babel. LOGOS by The Artaud Beats is getting good reviews and airplay...BBC Radio 3 Late Junction will be playing a track sometime between 28 and 30 July. Wheels within Wheels, new live and location recording album by Guy Harries & Yumi Hara will be released from Sombre Soniks on 23 July. It will be digital distribution, but we will make limited number of CDRs too which are better sound quality. Japanese version of LOGOS by The Artaud Beats will be released on 1 July from DiskUnion. This is the same disk and jacket as original version, with Japanese obi and liner notes attached. Jump for Joy! band is back: Yumi Hara, Geoff Leigh, Chris Cutler, Zappi, Jean-Herve Peron and Geraldine Swayne will be playing at Jazz Is Dangerous, Jazz Är Farligt, one day jazz festival, at Taubescenen, Liseberg Amusement Park, Gothenburg on 12 Aug.
Keiji Haino, Slynkören, Baby Grandmothers + Slowgold have also been confirmed. LOGOS, the first studio recording CD album by The Artaud Beats (Geoff Leigh, Yumi Hara, Chris Cutler, John Greaves) will be launched on 5 June 2015 at Le Triton, near Paris. Tim Hodgkinson is also performing with us! Daevid Allen has departed from this planet on 13 March, but he is always with us. Chris and Yumi are planning to make DVD from 2013 Japan tour for the people who have 'rain check' from 2014 Japan tour. Tue 26 May, I'm going to play with David Cross (ex-King Crimson, violin), David Jackson (ex-VdGG, saxophones) and Tony Lowe (guitar) as 'David Cross and Friends' for Starless Starlight CD launch event at The Bedford in Balham. I have played with David Cross in 2007, and released an album 'Dream of the Gryllidae' with Tony Lowe in 2010, but this will be the first occasion to play with David Jackson. And long awaited The Artaud Beats date in Europe at Le triton on Fri 5 June. 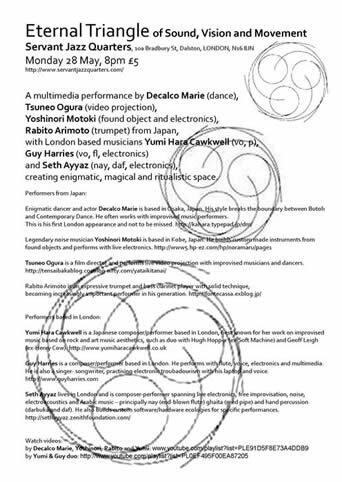 11 March 2015, Haco, Guy Harries & Yumi Hara, Black Box Studio, University of East London, 6.30pm. Haco will give a lecture, then we all play together. 8 May 2015, Chris Cutler & Yumi Hara with Kengo Sakamoto (b, Koenji Hyakkei) and Kazuya GACHA Uechi (b), Stratford Circus, part of FUEL, London,7.30-9pm. We will play an improvised set, then there will be a panel discussion about music making in Okinawa with regards to the importance of venues as nuturing space in comparison to London. Yumi started to do recording with Chris Cutler for her second solo album. workshop will be held at Koenji After Beat Studio, not the one in Okusawa. Chris Cutler & Yumi Hara will do workshop, talk & performance in several places prior to RIO JAPAN festival in November. 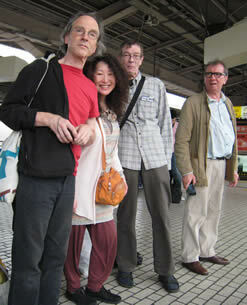 Chris Cutler & Yumi Hara have completed the Japan tour with incredible collaborators wishing Daevid's quick recovery. Daevid had operation on 11 June successfully. Due to sudden illness, Daevid Allen can not take part in Japan tour of you me & us, but Chris Cutler and Yumi Hara decided to go ahead without Daevid as he wanted us to do so. By hearing this news, we got incredible number of musicians to play with us wishing Daevid's quick recovery, including Alfred Harth (CASSIBER etc), Mitsuru Nasuno (Korekyojin, Altered States), Kazutoki Umezu (KIKI Band etc), HACO (After Dinner etc), Ryoko Ono (Sax Ruins) and we call it 'Get Well Soon, Daevid! tour'. We will issue Rain Cheque (1000 yen worth) with message from Daevid and drawing for all members of audience which can be used against next you me & us Japan tour when Daevid is back. And you can write 'Get Well Soon' message on a special notebook we carry during the tour, and we will pass it to Daevid. (Hiroshima date only) The first 10 members of audience will receive 'angel bear' handmade by the organiser, and the bears are kissed by the lion puppet which Daevid gave Yumi. Alfred Harth (ex-CASSIBER, as, pocket trumpet, KAOSS pad) and Sato Yukie, will tour with Chris Cutler & Yumi Hara, upon hearing Daevid Allen's ill health. As Alfred had already left CASSIBER when they did the legendery Japan Tour in 92, so this will be the first ever performance in Japan for both Alfred and Chris play together. you me & us CD 'Live in Japan' (title TBC) will be released at the beginning of forthcoming Japan tour (23 May-4 June), remastered by Bob Drake. 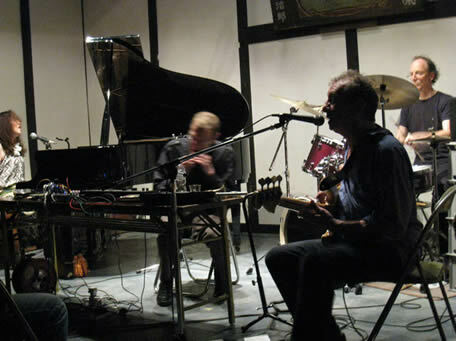 and these are the first occasion for Chris Cutler and Alfred Harth play together in Japan. Tue 27 May: Hiroshima, OTIS! Sun 10 Nov (eve), Hiroshima, Otis! 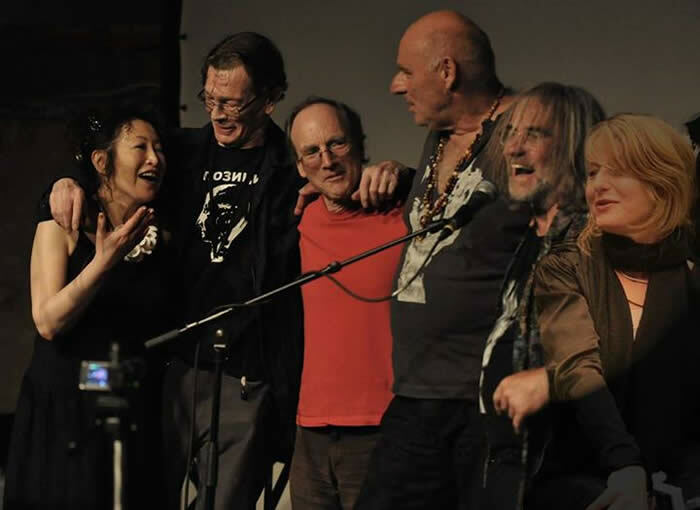 In addtion to the various dates with Daevid Allen previously announced, Yumi performed with him and Ian East (GONG) on 3 May 2013 in a private gig in Canterbury. The Artaud Beats 'Archive Box' Japan Tour 2012 has been completely sold out, and we are still getting orders. So we decided to create 'second impression' in slightly different package, numbered and signed by all memberes of the band, with extra DVDR (Shibuya gig shot from behind Chris Cutler), limited to 25 copies. Available from 29 May, beginning of Japan tour 2013. 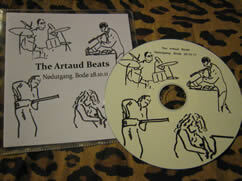 The Artaud Beats DVDR at Shibuya Bar Isshee is now available. that's why we didn't include it in the 'Archive Box', but some member of audience were extremely interested exactly for the same reason...you can watch how Chris choose his sticks and how he use them!! £10 postage inclusive. Please contact Yumi. Dates include Mammal Machine, Yumi's solo CD 'Statement Heels' Japanese version launch events, Kevin Ayers Memorial Concert. Please see gig dates page. Yumi as composer news: Yumi's pieces will be performed at several occasions in May...actually on the same day! Discography page and The Artaud Beats page are updated with order details of 'The Artaud Beats Japan Tour 2012 Archive Box' and 'The Artaud Beats T-Shirt'. 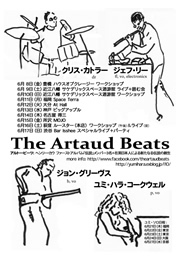 We are currently organising The Artaud Beats Japan Tour 2013 in late May-June. The details will be announced here shortly. Yumi will be visiting Japan in late March-early April to promote Japanese version of 'Statement Heels' (DiskUnion), with Japanese Obi and detailed liner notes. There will be an instore event at DiskUnion Progreesive-kan in Shinjuku on 31 March. Mammal Machine will touring Chubu-Kansai area in Late March. We had a very SPATIAL guest last night, Dada Ali, aka Daevid Allen at Sonic Rituals #2! Yumi will be on tour in Japan from 7 Dec to 25 Dec, as solo, with Mammal Machine, with Yumi Hara Cawkwell-Tempered Band etc. The Artaud Beats Japan Tour 2012 Archive Box of Complete Recordings (8CDRs + 4 DVDRs, limited edition of 50 copies, numbered) will be available during Yumi's Japan tour in December, and can be dispatched worldwide in January. 8000JPY or 67GBP, if you order with The Artaud Beats T-shirt, 10000JPY or 83GBP. Please email Yumi yumi'at'yumiharacawkwell.co.uk to order. 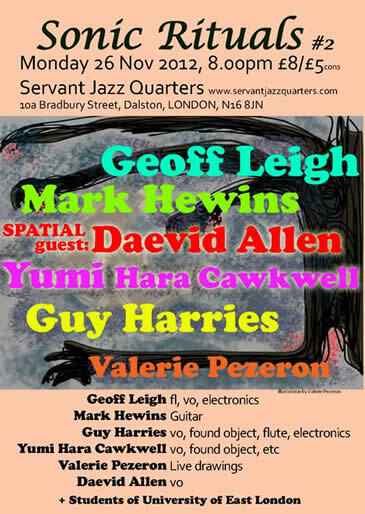 Sonic Rituals #2 will take place at Servant Jazz Quarters in Dalston, London, on 26 Nov. Geoff Leigh and Mark Hewins (Soft Heap, Canterbury Family, Gong etc) will join Yumi Hara Cawkwell and Guy Harries, and live drawings by Valerie Pezeron.
! !VENUE CHANGE!! 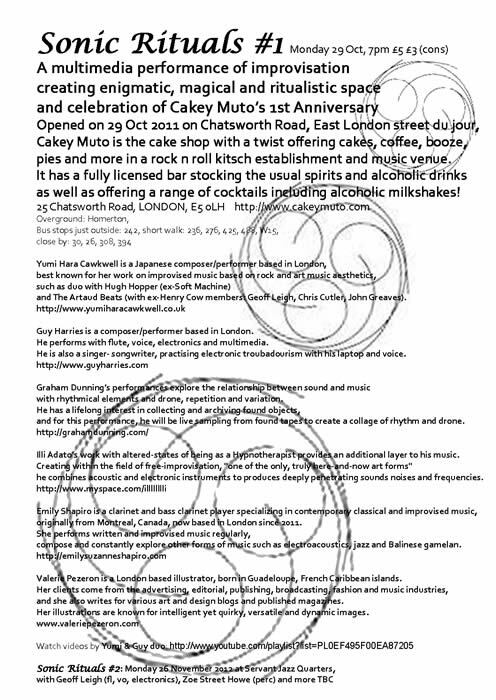 The firest SONIC RITUALS on 29 Oct is now at Cakey Muto, a lovely cake shop with fully licenced bar located on Chatsworth Road, East London street du jour, and celebrating the 1st anniversary on the day!! Yumi & Guy will also be performing at OUT OF THE CAGE, John Cage festival at Trinity Laban Conservatoire of Music and Dance on Fri 26 Oct, 14.00-16.00, 17.15-19.30 at Room G73, with two grand pianos!! 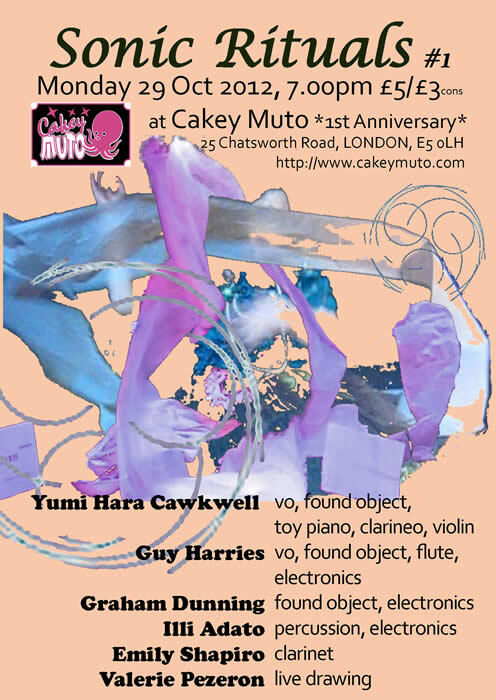 Yumi & Guy Harries will be hosting SONIC RITUALS live performance series. We are excited to have a number of great guest performers! A small quantity of the Limited Edition CDR Nodutgang. Bodo 28.10.11, Live at Nodutgang Festival, Bodo, Norway is now available, following the response from the listeners of 'Sonic Rituals', Clear Spot at Resonance FM on 24 September. Please contact us. Guy Harries and Yumi hosted the show and invited Chris Cutler as the first guest. We performed a 'Sonic Ritual' improvisation set using household objects and toy instruments. 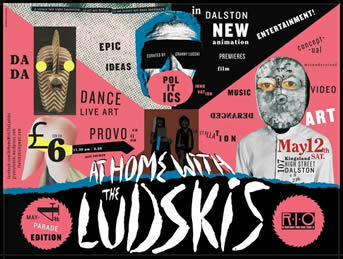 Yumi & Guy Harries will be performing at 'At Home with the Ludskis #6' at RIO Cinema, Dalston, London on 22 September. They will be on at the very beginning for a 10-minutes set, then 6-minutes glammed-up set later on. Yumi's December Japan tour dates are almost fixed now, including Mammal Machine Kyushu 3 days, Bar Isshee 3 Days of Christmas Special, reworking of prog classics performance, performance of pieces from solo CD 'Statement Heels' with Tatsuya Yoshida(d), Atsushi Asano(b) and Natsuki Kido(g), and improvised music sessions. Visit Gig Dates page for detalis. Yumi & Guy Harries will present SOUND RITUALS, a radio progrmme at Resonance 104.4FM on Monday 24th September 2012, 8-9pm British time. You can also listen over the internet worldwide. The progrmme is developped from recent Sound Rituals performances by Yumi & Guy, and will involve guests to perform with them. They will also be hosting SOUND RITUALS live performance series at Servant Jazz Quarters on 29 October and 26 November. The Artaud Beats (Geoff Leigh: flute, voice, electronics, Yumi Hara Cawkwell: keyboard, voice, Chris Cutler: drums, John Greaves: bass, voice) Japan Tour and Yumi solo Japan tour have successfully been completed. Thank you very much for the people who attended the gigs and workshops, helped organising events, and musicians who performed together. Please visit our facebook page for more photos and video links updates. Restaurant-Music Club Kolonada, v. Kudirkos st, 22, Druskininkai, Lithuania. The event is part of contemporary music festival DruskoManija'12, and this year's theme is 'Electro-Acoustic Archaic'. Yumi & Guy Harries will be performing on 18 May 2012 at Druskomanija 2012, in Druskininkai, Lithuania. Yumi's piece was performed there last year, and this time Yumi is participating as a performer. 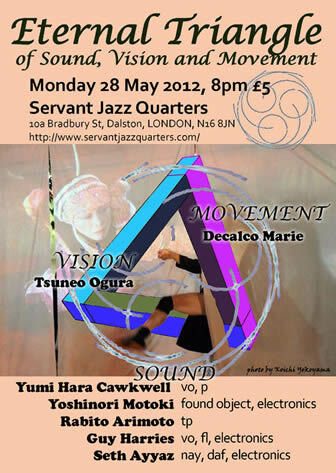 Yumi and friends from Kansai area in Japan will be performing in London and Paris. Yumi is now planning Japan Tour in December. On Fri 20 May 2011, KEYNOTE + (Kate Ryder and Jane Chapman - Prepared piano & harpsichord) performed 'Luminous' for prepared piano and clavichord (this time by harpsichord) at The Clore Ballroom, Royal Festival Hall, part of 'Lang Lang Inspires: Young Pianists Week'. On Wed 25 May 2011, 7pm, BAccK +/- Harp (Irmantas Andriūnas: birbynė, Danielius Rozovas: accordion, Viktorija Smailytė: harp) will perform 'Nota Bene', originally written for shakuhachi and clavichord, this time by Lithuanian wind instrument 'birbynė'. Also, the long-awaited date for a performance of Yosshy YUMI-Yama (Yumi, Tatsuya Yoshida, Hoppy Kamiyama) using 2 grand pianos and a drum kit has been confirmed: 14 September 2011 at Nagakute Bunka no Ie, near Nagoya, launching Yumi's solo CD! Dream of the Gryllidae by Yumi Hara Cawkwell & Tony Lowe, Mitsugi (Esoteric Rituals) by Mammal Machine (Yumi, Mitsuru Tabata, Rie Miyazaki, Yasuyuki Watanabe), and Ride a White Rabbit by Yumi Hara Cawkwell & Sato Yukie are now available from Discography page! Mitsugi (Esoteric Rituals) is getting critical attention, and now already got at least 5 reviews. Please also visit Discography page for links to the reviews. Dream of the Gryllidae, a new album with Tony Lowe will be out from Academy Recordings for digital distribtion only, and new MySpace has now been setup, so visit www.myspace.com/yumiharaandtonylowe to listen some samples from the album and watch promo video for 'Cicadas will Cry for Me', the last track of the CD! Yumi will be in Japan in December for launch tour of two CDs, Mitsugi (Esoteric Rituals) by Mammal Machine (Yumi, Mitsuru Tabata, Rie Miyazaki, Yasuyuki Watanabe) from Captain Trip Records and Ride a White Rabbit by Yumi Hara Cawkwell & Sato Yukie from KOOTOWN. Please visit gig dates page for details. Dream of the Gryllidae, a new CD album with Tony Lowe has now been mastered, and a promo video for 'Cicadas will Cry for Me', the last track of the CD, now being made...watch the space. Yumi is translating Japanese version of 'First Steps with the Clarineo' DVD and companion book. Clarineo is a C Clarinet developed by Graham Lyons. Yumi is going to do a Japan tour in June-July, with exciting line-up of collaborators including Kazutoki Umezu, Mitsuru Tabata, Rie Miyazaki, Tatsuya Yoshida, Hoppy Kamiyama, Ryuichi Yoshida, Ryoko Ono, Atsushi Tsuyama, yasuyuki Watanabe, Morihide Sawada, Ichiro Hosoya, and MEW. There will also be four workshops in Osaka, Nagoya and Tokyo. Please visit Gig Dates page. Steve Howe Trio has been using live photos and videos taken by Yumi for their MySpace for a while, now they used one for their forthcoming live album 'Travelling'! It will be released in March, and will be available during their UK tour. Please visit www.myspace.com/stevehowetrio. also the on-disk printing is my photo. Yumi's pieces will be performed in three concerts in February. Please note: the timing of the recital is very strict at the Abbey, so please get there before the scheduled performance time to avoid disappointment. 2009 marked pianocircus' 20th Anniversary and as part of these celebrations they will be running a festival in February celebrating new innovations and developments for the piano since the inception of the group in 1989. David Appleton (Piano) with Barbara Gutierrez (artist/film) Plus Keyboard Choir and Lorraine Bowen. In addition to the tour with Akira Sakata and Tatsuya Yoshida, Yumi will be performing with Yukie Sato, Japanese guitarist who is based in South Korea, on 11th December at Bar Isshee in Shibuya, Tokyo. Yumi is now editing the recording with Yukie Sato, to be available during the Japan tour. 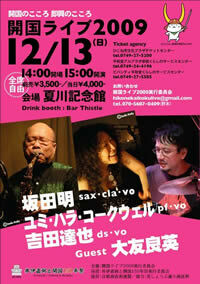 Improvisation Workshop is now scheduled on 20th December in Tokyo. Yumi took part in the first performance of 'Maria Kan'non' for voice, sho, electric violin and electronics, which surprised New Music audience who knew Yumi only as a composer! PianoCircus will perform 'Groove Study Mega Mix' at Sound 2009 (28th Oct Aberdeen, 30th Oct Naim) , Kate Ryder will perform 'Farouche' for toy pianos at the Cutting Edge (14 Nov), and new piece 'Maria Kan'non' for sho, electric violin and live electronics will be performed by OKEANOS with [rout] at the Cutting Edge (19 Nov). Yumi will be performing in Hikone in Japan on 13th December with Akira Sakata, Tatsuya Yoshida and Yoshihide Otomo (guest), to celebrate the 150th anniversary of opening of Japan. 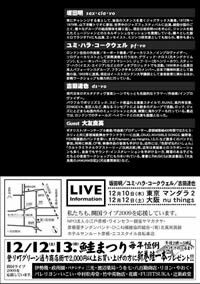 There will also be performances by Yumi, Sakata & Yoshida in Tokyo (10th, MANDA-LA2) and Osaka (12th, nu things). Improvisation workshop in Tokyo is currently being planned. Interview, concert review, workshop review and CD review of Geoff Leigh and Yumi Hara were featured in EURO ROCK PRESS, specialist magazine in prog rock and experimental music in Japan. 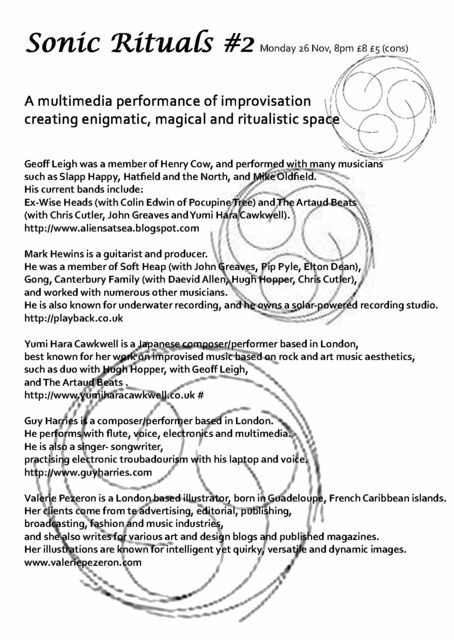 Geoff Leigh & Yumi Hara performed at the Avantgarde Festival, joined by Chris Cutler and John Greaves!! Four of us performed a full 1 hour improvisation with many magical moments. Watch video 1, video 2, video3. 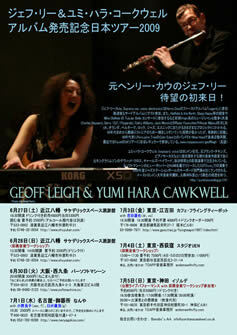 Geoff Leigh & Yumi Hara successfully completed Japan tour. An extensive covarage of the tour, including their interviews, live report, and workshop report will appear on EURO ROCK PRESS (Japanese language specialist magazine in prog rock and experimental music) 28 Aug on sale. Geoff & Yumi will be performing at Avantgarde Festival, Schiphorst, Germany, on 30 August. 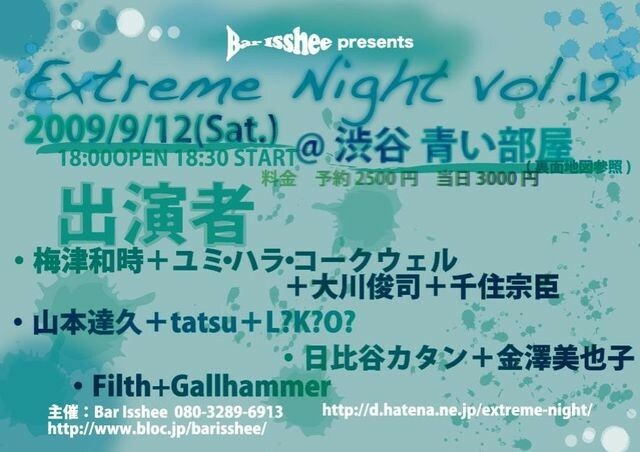 Yumi will be back in Japan in September, this time to perform at 'Extreme Night' at Aoi Heya, Shibuya, Tokyo, with Kazutoki Umezu, Shunji Okawa and Muneomi Senju, and to chair a panel discussion 'Evaluation of Musical Improvasation in Education' at Japan Association of Musical Improvisation conference, Kobe University, 20-21 September. Yumi recorded quite a lot of material with Tatsuya Yoshida (dr, vo) while she was in Japan this summer, including studio recording of her compositions, studio improv recording and live improv recording with Geoff Leigh!! 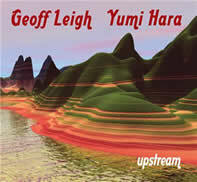 Yumi will be performing with Geoff Leigh on 15th May at the Drone's Club in North London. This is going to be the pre-Japan tour show in June-July. Two performances at Cafe OTO with Akira Sakata went extremely well. On the 8th, we performed with Asaf Sirkis and a special guest, Yoshihide Otomo. 12th was with Charles Hayward, and Sean Kelly took great pictures! Please visit Sean's site here. He also came along to the Klinker gig with Geoff Leigh and Gerry Fitzgerald on 19th March. Photos from the night here. Great review on Hugh Hopper Benefit concert in Jazzwise Feb 2009, Issue 127. '...Jazz meets performance art, as her amazing voice headed off into dog-whistle territory, but there was such good humour and warmth in her performance. As she led us into 'Hope for Happiness', you couldn't help but love her' (Duncan Heining). Please find out more about the concert on p. 58 of the magazine!! 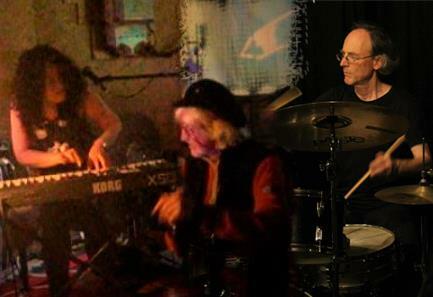 Yumi will be performing with Geoff Leigh and Gerry Fitzgerald on 19th March at The Klinker, Cross Kings. The Bartok project is finally on! David Applton will be performing Yumi's new solo piano piece 'Cosmos Massive No.901' at the Space, part of Enterprise 09 Festival on 3rd May. David asked composers to write new pieces which somehow relate to Bartok. He will perform these new pieces together with Bartok's substantial piano works. Yumi will be performing with Akira Sakata again, this time in London, in March. Two dates at Cafe OTO are confirmed with guest drummers: 8th with Asaf Sirkis and 12th with Charles Hayward. It has been 13 years since I last played with Charles!! And this is going to be my first performance with Asaf, who shares a passion for pipe organ with me! Nota Bene, Yumi's piece for shakuhachi and clavichord will be performed by Kiku Day and Michael Bonaventure at Purcell Room on 26 March. HUMI limited edition CD-R, DVD-R, T-Shirts and official CD Dune are now available from HUMI MySpace or HUMI MySpace Japanese site. These were previously available only from Yumi's solo gigs and Hopper benefit concert in December. Only several T-shirts are left-so please order now to avoid dissappointment. The Hugh Hopper Benefit Concert on 14 December was very successful! Thank you very much for the people who came along, buying CDs and T-shirts! All profit have sent to Hugh. And thank you to John Etheridge who organised the concert. Yumi performed a 15 minutes set including 'Hopeful Impressions of Happiness' (based on 'Hope for Happiness' written by Hugh's brother Brian, who was there on the night) and 'Wrapped Box 25/4 Lid (with Ribbons)' piano solo version. 'Six Flowers' received second performance at Community Music Center of Boston, MA, USA, on 23 October by Christopher Bush and Carol Minor. In addition to the November dates, Yumi will be performing in Japan in September too! 11 September 2008, Barrel House, Ikebukuro, Tokyo, with Ryuichi Yoshida (Baritone sax), Toshiki Nagata (Double bass) and Hoppy Kamiyama (Keys and gadgets). Description:Improvisation workshop with Yumi Hara Cawkwell. Booking essential to andomew'at'nifty.com Bring your own instrument and amplifier if needed. (n.b. Flying Teapot is located on basement floor, and there is no lift and car parking) ’Flats’ drum kit is provided. Improvisation workshop with guest Taiqui (dr, vo, from Ain Soph). Yumi will give some talk about various techniques of improvisation, then perform a short improvisation with Taiqui while video record it. The video will be immediately played back, and Yumi will analyse the performance and make comments to explain what was going on. Then participants will perform improvised music in small groups. Instruction will be given according to the technical ability and previous knowledge in music of the participants. All instrumentalists and vocalists are welcome. Solo performance at the legendary bar in Konohana-ku, Osaka. With an amazing female sax player Ryoko Ono, who has performed and collaborated with many big names, recently performed with Tatsuya Yoshida (dr) as Sax Ruins. Due to Hugh Hopper's health condition, HUMI Japan tour is now postponed. It is not possible for Hugh to take long haul flights this autumn. Yumi is going to do solo Japan tour in November. Dates and venues will be announced shortly. Yumi will perform a short set at Downtown Music Gallery in New York on Tuesday 7th October, 7pm. HUMI (Hugh Hopper & Yumi Hara Cawkwell) Dune in June Japan Tour is now postponed to October/November, but Yumi will perform as solo on some dates. Please check out www.myspace.com/humimyspace (English) or www.myspace.com/humimyspacejapanese (Japanese) for updates. Yumi's solo dates for 'Tokyo Summer Festival' (4-6 July) remain unchanged. HUMI (Hugh Hopper & Yumi Hara Cawkwell) debut CD Dune is out now via MoonJune website. It will be available during the Japan tour, and UK and US release to follow as planned. HUMI (Hugh Hopper & Yumi Hara Cawkwell) debut CD will be released in June from MoonJune to coincide the Japan Tour. US and UK release to follow. HUMI will be performing at EAST Showcase on 11th June at Soho Thatre. 'Cicadas Project/Playsongs Now', Yumi's solo performance with workshop participants will be presented at Mon'naka Tenjo Hall on 6th July, part of Tokyo Summer Festival 2008. Yumi is currently writing a new piece for toy pianos, scheduled to be performed on 12 April 2008 at The Space, London, by Kate Ryder, part of 'Enterprise 08' series. Yumi has recently been commissioned to write a new piece for clarinet and piano by Carol Minor, as part of the Glens Falls Symphony Orchestra’s Musicbridge series (Glens Falls, state of New York) in october 2008. Everyday Can be Christmas, a christmas song Yumi wrote in ca.1995 (words by Brendan Beals) has been uploaded on Yumi's MySpace. Yumi is writing a new arrangement for Delta Saxophone Quartet, for their current Soft Machine themed project, a new piece for toy piano for Kate Ryder. HUMI (Hugh Hopper & Yumi Hara Cawkwell) will be touring Japan in June 2008. Vaseline Towers gig on 30th November 2007 at the Klinker South has been cancelled due to Pheecle Debbry's illness. Get well soon! HUMI (Hugh Hopper & Yumi Hara Cawkwell) debut performance videos have been uploaded. Please visit HUMI MySpace or here (the same section as the Resonance FM broadcast) and here. HUMI's debut performance at Club Integral on the 1st Nov went extremely well, and an excerpt from the live recording of the gig was broadcast on Resonance FM (104.4 FM Central London and www.resonance.com for anywhere in the world) on 22nd Nov. Some photos from the gig by Sean Kelly are found on HUMI MySpace, and video will be uploaded soon! Yumi's academic site at the University of East London has been revamped. Michael Bonaventure will be performing Yumi's organ piece 'Hibernal' on 9th Dec at All Saints Blackheath, 5.15pm. His performance of the piece at the Union Chapel can be viewed here. It has been very busy autumn for Yumi. Yumi visited Japan in September to attend a preparatory symposium for Aichi International Art Festival 2010 as a member of the panel, and did several performances. The details of the performances are in Yumi's blog in her Myspace. Some footage will appear there shortly. As soon as its MySpace went online, HUMI, a new collaboration with Hugh Hopper (Soft Machine, Soft Machine Legacy, Isotope, etc), is getting a huge response!! Currently only four short segments from recent recording session can be heard there, but CD enquires from labels and audience are flooding in! On 22nd October, some longer recordings will be played on Resonance FM http://resonancefm.com/listen worldwide or 104.4FM in Central London, 19.00-20.00 UK time. The debut gig is at Club Integral, 1st November 2007, Canterbury Arms, Canterbury Crescent, Brixton, LONDON SW9. Incidentally, Hugh Hopper and David Cross will be performing with Clearlight drummer Chris Stassinopoulos on 18 & 19 January 2008 in Athens. Because of this, Yumi, being in collaboration with both David and Hugh, is talked about in What's Rattlin'? (Canterbury music related forum)! David Cross & Yumi Hara Cawkwell MySpace appeared as a news item at DGM Live News (King Crimson website). More musicians are using photos taken by Yumi. Photos taken at The Producers' gig at Jazz Cafe, 24th July, are used at Chris Braide's MySpace, and a photo of Dylan Howe can be found at his MySpace. For more photos, including the latest ones taken at Bill Bruford & PianoCircus on 21 September, please visit Yumi's photography MySpace. is going to be performed again by PianoCircus on 6th November at Rome University, Italy. Yumi has been incredibly busy doing lots of gigs (including her niece's wedding in Tokyo...she played 'And You And I' on the organ for bride's entry! ), writing music and teaching this spring......also taking photos!! Please visit www.stevehowe.com Two stage photos of Steve Howe Trio are taken by Yumi during their UK tour. Until recently she had been busy being taken photos (see Films & modelling page), but Yumi used to take a lot of photographs and got some awards in baseball photography in Japan in the late '80s. Pandora Ensemble has taken Yume no Yo ni (In This World of Dreams) for piano trio into their repertoire, originally written for Trio Japan and premiered back in 2001 and a CD is released in Japan. They will perform this gagaku-inspired piece (oh, yes, I did that back in those days...), based on Ryokan's tanka (oh, yes, I do admit I did that!) at Hellenic Centre on 22 June. And Yumi will be back in Corsham Festival!! Keynote+ (Kate Ryder & Jane Chapman) will perform Luminous for prepared piano & amplified clavichord on 29th June. They premiered this piece last autumn and they performed recently at UC Berkeley, using harpsichord instead of clavichord, and it has been reported that it also sounded lovely. A lot of gigs are coming up this spring. Similar solo performance has been confirmed at East@West Wing Festival, Slough on Sat 3rd March 2007. Yumi (vo) performs with Reiko Manabe, award winning flautist. Improvised performance with Jon Raskin, Liz Albee, Gino Robair. Yumi performs in the 11pm set. Another set from 8pm. Be there early to avoid disappointment. Yumi will be performing two songs as a dancer with Frank Chickens. Kiku Day will premiere 3 pieces written for her and the ji-nashi shakuhachi specifically by Yumi Hara Cawkwell (Nota Bene, 2007), Mogens Christensen and Gabriel Erkoreka. Part of the SOAS Concert series. Yumi's piece Yume no Yo ni (In This World of Dreams) for piano trio is performed by Pandora Ensemble. Hideously gorgeous funky disco & MOR unplugged with newly developed repertoire of prog rock and electro. Lemon Squeezer: Yumi Hara (vo, piano, battery driven Casio keyboard) and Matt Scott (accordion, piano, voice). Lo-tech duo performs their favourites such as Je T'aime Moi Non Plus and Couid It Be Magic, plus prog, proto-prog and post-prog interpretations. Yumi Hara (vo, piano, battery driven Casio keyboard) and Matt Scott (accordion, piano, voice) plus special guests. Yumi is going to present a paper at Music of Japan Today, UMBC (University of Maryland Baltimore County), 30-31 March. Several gig dates are being booked in California in April. Watch this space! Vaseline Towers new date is now confirmed: Thursday 11th January at The Klinker (South) @ The Ivy House, 40 Stuart Rd, SE15, doors open 8.30pm - £5/£3 concessions. Yumi will sing several songs. Vaseline Towers at The Klinker (North) on the 26th December 2006 has been cancelled due to the venue problem. It may be rescheduled to the Klinker (South) in January...watch this space! Last minute booking! Yumi will sing several songs with Vaseline Towers at The Klinker (North) on the 26th December 2006. Yumi (DJ Anakonda) will be DJing before and after PianoCircus performance at 93 FeetEast on the 17th January 2007. Expect gorgeous mix of Minimalist and Prog. Yumi's MySpace is now up and running! There are some audio and video clips too! THE BRITISH COMPOSER AWARDS 2006 NOMINATIONS ANNOUNCED on the 2nd of November. has been nominated in instrumental solo and duo category. The British Composer Awards enters its fourth year of celebrating, rewarding and profiling the work of classical composers in the UK and Northern Ireland. The Awards will take place on Friday 24th November at the Hayward Gallery on London's South Bank. On the same evening, the BBC Concert Orchestra will perform a programme of music by contemporary British composers at the Queen Elizabeth Hall and both the Awards ceremony and the concert will feature in a BBC Radio 3 broadcast on Monday 27th November. Luminous for prepared piano and amplified clavichord was premiered by Kate Ryder and Jane Chapman at bmic Cutting Edge, 26th October, The Warehouse. The concert was sold out!! Yumi has completed Luminous for prepared piano and amplified clavichord, commissioned by Kate Ryder and Jane Chapman, supported by the Gen Foundation. Yumi handpicked lovely hair grabs, handbag with metallic chain strap, and bracelets to prepare the piano, and metallic lipstick container will be used to play inside clavichord... They will be captured by a video camera and projected so that the audience can see what is going on inside the piano. Preview at Morley College on 17th October, and proper premiere at bmic Cutting Edge, 26th October, The Warehouse, 7.30pm. About The Cutting Edge concert above, Kate Ryder speaks to David Francis, senior producer of Contemporary Music Network, in spnm New Notes October issue (on the cover, it says 0906 for some reason), p. 07. Kate & Jane will lead a workshop at Royal Academy of Music on Monday 13th November. Hibernal for organ was performed by Michael Bonaventure at Sheffield Cathedral on 29th September. Another performance is scheduled on Monday 23rd, 1pm, at Southwark Cathedral, London. Shakuhachi and clavichord piece commissioned by Kiku Day: premiere date has been confirmed: Thursday 8th March 2008 at SOAS. Yumi will be performing at Dennis Austin tribute gig on Friday 20th October at the Klinker (North). Lemon Squeezer (Yumi Hara & Matt Scott) autumn date is confirmed: Tuesday 12th September 2006 at The Klinker (north). Yumi took part in 'Karaoke Cabaret Lounge' presented by Kazuko Hohki & Frank Chickens at HOME event at The Theatre Museum, Covent Garden on 2nd September 2006, as a karaoke judge with Kazumi Taguchi (one of the original Frank Chickens), also sang 'Heart of Glass' by Blondie. The Frank Chickens performance was done by the third incarnation of Frank Chickens (Kazuko, Chika Nakagawa, Ray Hogan) plus Ricca Kawai (from the fourth incarnation) and some new recruits. It seems like it was the end of the fourth incarnation of Frank Chickens, and members from that era, such as Akiko Sato, Tomoko Minamizaki, Kinue Kato and Yumi are now becoming ex-member of Frank Chickens, although there was no consultation to these personnel. Yumi will be guest presenting ONKYODO, a programme of Japanese underground/alternative music, at Resonance 104.4 FM (central London), also at www.resonancefm.com (worldwide), on Tuesday 22nd August 8pm-9.30pm. New organ piece Hibernal (I. Climbing up the Frozen Waterfall, II. Light of the Distant Sun, III. Frost) will be premiered by Michael Bonaventure at All Saints Blackheath, Sun 13 Aug 2006, 5.30pm, free entry. A rare performance as vocal and keyboard with Chris Biscoe (Cl, Fl) and Pete Flood (dr, perc, Farmyard Animals) at Chelsea and Westminster Hospital, Thu 24 Aug 2006, 1.00pm, free entry. This gig is dedicated to Dennis Austin (perc) who died on 23rd July, was going to perform with us. Yumi will be DJ-ing for 'Onkyodo' at Resonance FM, one of Tuesdays in August. Watch this space. Yumi has been appointed as Lecturer in Music at the University of East London. She will be teaching music theory, performance and production, improvisation and composition from September 2006. Would like to study with Yumi? Go to www.uel.ac.uk. Music programme is in the School of Social Sciences, Media and Cultural Studies, and the undergraduate programme is called 'Music and Culture: Theory and Production'. Yumi is currently writing a new piece for prepared piano and clavichord for Kate Ryder and Jane Chapman. Expect innovative use of feminine everyday objects for these instruments. Yumi is going to start a big project for pipe organ and electric guitar, with possibly saxophones, percussion and choir. Please see more details for new pieces in the Performance Dates page.